Hydrogen sulfide (H2S) is a naturally occurring gas contained in many of the world’s crude oils. It is also formed by the degradation of sulfur compounds in the oil when it is exposed to high temperatures or catalysts in the refining process. H2S gas can cause a wide range of health effects. Workers are primarily exposed to hydrogen sulfide by breathing it in. The health effects depend on how much hydrogen sulfide is inhaled and for how long. Exposure to very high concentrations can quickly lead to death. On April 13, 2015 the Asphalt Institute’s Health, Safety and Environment committee held a seminar discussing H2S. The seminar was led by Shell’s senior toxicologist David Steup and Jake Vandevort who is with Bergeson & Campbell – the group tasked with managing the H2S coalition. Steup’s segment of the seminar focused on risk and exposures of H2S and Vandevort’s presentation detailed coalition efforts and future initiatives. H2S is a known workplace hazard in a variety of environments – particularly enclosed spaces. It is a colorless gas with a pronounced odor (rotten eggs) that is flammable and heavier than air. Since H2S is a gas at typical storage temperatures, it has a tendency to migrate from the liquid phase into the vapor phase above the oil. Certain tank conditions, such as increased liquid volume, agitation and high temperatures, can intensify this already hazardous situation by changing the ratio of H2S in the liquid and vapor phases of the crude oil. 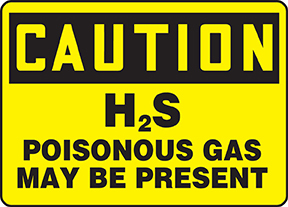 H2S is found in petroleum (including asphalt) and natural gas. It can be released by volcanic and geothermal activity. It can be formed by breakdown of organic matter. It is found in human and animal waste (sewer gas), found in paper pulp manufacturing and in decaying vegetation (swamp gas). It is formed as a byproduct of certain chemical reactions and is also formed naturally in the human body in small amounts. The foremost consideration when dealing with hydrocarbons containing large amounts of H2S is safety of personnel involved in its storage, handling and transportation – and for the safety of the community. H2S is a known workplace hazard in a variety of environments, particularly enclosed spaces. Exposure to very low levels of H2S can result in significant health ramifications. H2S is especially insidious because it deadens the sense of smell at concentrations as low as 30 ppm and death can occur within a few breaths at concentrations of above 700 ppm. The H2S Coalition consists of industry trade groups engaged in regulatory, science policy and related issues pertinent to entities with an interest in H2S. The coalition provides a forum for its members to ensure their interests are protected and their voices are heard. It focuses on opportunities to improve the safe use and handling of H2S and to advance advocacy positions. Members monitor and address regulatory, product stewardship, research and related matters pertinent to H2S uses and manufacturing applications. Coalition members work together to make decisions on advocacy efforts and resource allocations. As of 2015, coalition members include the Carbon Disulfide Coalition, the American Petroleum Institute, the American Forest & Paper Association, the American Coke and Coal Chemicals Institute, the Asphalt Institute and the Sulphur Institute. The coalition is producing a wallet card on guidelines for confined space entry for use in the workplace. • Evaluate the situation before you enter. • H2S may be in manholes, pits, sumps and sewers. H2S will settle in low-lying areas. • Be aware of odors. • You may not detect H2S until you reach the bottom of a space. • Only trained and authorized workers should enter confined spaces. • Identify known H2S sources. • Use on-site monitoring and detection equipment. • Do not rely on your sense of smell alone. • Do not attempt rescue unless properly trained. Sohi is the Director of Health, Safety and Environment at the Asphalt Institute.